JFrog swampUP DevOps event is here! JFrog’s annual swampUP event of the year is here! The DevOps user conference will take place on May 16-18, 2018, in the beautiful Napa Valley. This is your opportunity to network and learn how other DevOps experts leverage JFrog products along with best practices from other DevOps thought leaders who will also be there. This is the fourth JFrog swampUP DevOps event and will be the largest to date. 95% of surveyed swampUP attendees from last year indicated that they would recommend swampUP to their peers. Get a peak of last year’s event. Currently, JFrog is offering a limited number of Early bird tickets that will save you more than $700. Available until February 28th. Get hands-on training from JFrog Solution Experts. This level of training can cost from $700 to over $1000. 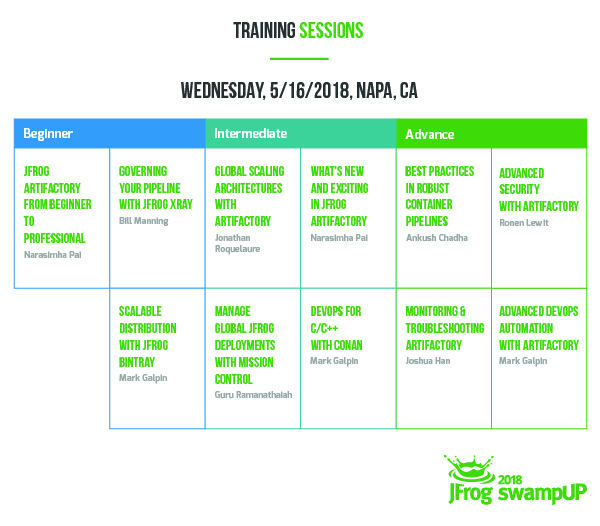 Whether you are new to JFrog or looking for a refresher course, swampUP will feature one FULL day of hands-on training with beginner to advanced topics. There is nothing better than spending one-on-one time with JFrog technical experts – who created the tools you use. During swampUP conference days, you can schedule some 1-1 time with our key technical staff including our CTO – Yoav Landman, Chief Architect – Fred Simon, VP of Product – Dror Bereznitsky, and VP of Solutions – Jagan Subramanian. Yes, you’ll learn a lot during the conference, but the knowledge doesn’t have to stop with you. After swampUP, you can share valuable ideas and solutions you learned at the conference with your team. Furthermore, you will have access to the hands-on lab after the event and show your team the best practices. SwampUP focuses on providing a special experience to you. Unlike other big conferences, you will have more opportunity for direct conversations with the early adopters of DevOps. Join the hundreds of other experts attending swampUP to network, share and learn the best practices around Continuous Pipelines and DevOps. JFrog offers ​the only​ universal solution ​with integrations to cloud infrastructures, programming languages, and market leading DevOps tools. Talk with these leading DevOps companies about how we work together to enable faster and more reliable software releases at our Partner Expo. In addition, watch live demos from ​​Red​ ​Hat, Google (GCP), AWS, MSFT (Azure), CloudBees, Mesosphere, IBM, BlackDuck, SumoLogic, CircleCI, Undo and more. To see the final sponsorship follow us on our website. Save now with the Early Bird Ticket Offer.